MILWAUKEE, Aug. 27, 2018 /PRNewswire/ -- EnSync, Inc. (NYSE American: ESNC), dba EnSync Energy Systems, a leading developer of innovative distributed energy resources (DERs), business models and controls for residential, commercial and utility installations, announced today that the company will feature its Home Energy System (EnSync Home) at the upcoming Solar Power International (SPI) conference. 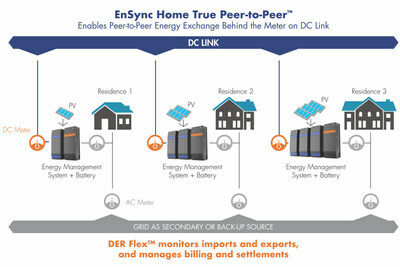 The installation, which will connect to SPI's live microgrid at the Smart Energy Microgrid Marketplace, will feature two EnSync Home systems exchanging electricity in real time, via EnSync Energy's True Peer-to-PeerTM DC-LinkTM technology. This pioneering feature allows networked residential units to share, buy or sell electricity with one another, optimizing the economic benefits of the photovoltaic (PV) installation across the network of residences. In this network, when a residential unit generates energy in excess of its load, it will charge the unit's energy storage battery. Once the battery reaches full capacity, any additional energy generated then enters the DC-Link, a platform that interconnects individual residential units behind their utility meters and channels this electricity to other units in the network that demand more energy than they are generating or storing. The export and import from each unit is then metered and reported to the utility, though the True Peer-to-Peer network can also be deployed as a non-export system. "We look forward to showcasing our Home Energy System and its unique peer-to-peer technology at Solar Power International," said Brad Hansen, president and CEO of EnSync Energy. "There are millions of individually metered multi-family property units across the United States that will never be economically viable for PV or PV-plus-storage when addressed separately. This breakthrough energy exchange capability aggregates and optimizes any inefficiencies due to vacancy rates, low load units, shading impacts and other problems at the property level, thereby drastically improving economics for the entire site. Attendees at the show will see the exchange of energy between end users in real time and learn how this pioneering technology addresses critical challenges for the multi-family property segment of the commercial-residential market." Beyond exhibiting, EnSync Energy executives were also selected to lend their industry expertise as speakers at educational sessions about microgrid use cases for multi-residential units and the cable industry. Solar Power International will take place on September 24-27, 2018, in Anaheim, CA. The Smart Energy Microgrid Marketplace will be located in the Smart Energy section in Hall D. Conference attendees can visit EnSync Energy at booth #4153. This press release contains forward-looking statements within the meaning of Section 27A of the Securities Act of 1933, as amended, and Section 21E of the Securities Exchange Act of 1934, as amended, that are intended to be covered by the "safe harbor" created by those sections. Forward-looking statements, which are based on certain assumptions and describe our future plans, strategies and expectations, can generally be identified by the use of forward-looking terms such as "believe," "expect," "may," "will," "should," "could," "seek," "intend," "plan," "goal," "estimate," "anticipate" or other comparable terms. All statements other than statements of historical facts included in this press release regarding our strategies, prospects, financial condition, operations, costs, plans and objectives are forward-looking statements. Examples of forward-looking statements include, among others, statements we make regarding project completion timelines, our ability to monetize our PPA assets, statements regarding the sufficiency of our capital resources, expected operating losses, expected revenues, expected expenses and our expectations concerning our business strategy. Forward-looking statements are neither historical facts nor assurances of future performance. Instead, they are based only on our current beliefs, expectations and assumptions regarding the future of our business, future plans and strategies, projections, anticipated events and trends, the economy and other future conditions. Because forward-looking statements relate to the future, they are subject to inherent uncertainties, risks and changes in circumstances that are difficult to predict and many of which are outside of our control. Our actual results and financial condition may differ materially from those indicated in the forward-looking statements. Therefore, you should not rely on any of these forward-looking statements. Important factors that could cause our actual results and financial condition to differ materially from those indicated in the forward-looking statements include, among others, the following: our historical and anticipated future operation losses and our ability to continue as a going concern; our ability to raise the necessary capital to fund our operations and the risk of dilution to shareholders from capital raising transactions; our ability to successfully commercialize new products, including our MatrixTM Energy Management, DER FlexTM, DER SuperModule, and Agile TM Hybrid Storage Systems; our ability to lower our costs and increase our margins; our product, customer and geographic concentration, and lack of revenue diversification; the length and variability of our sales cycle; our dependence on governmental mandates and the availability of rebates, tax credits and other economic incentives related to alternative energy resources and the regulatory treatment of third-party owned solar energy systems; and the other risks and uncertainties described in the Risk Factors and in Management's Discussion and Analysis of Financial Condition and Results of Operations sections of our most recently filed Annual Report on Form 10-K and our subsequently filed Quarterly Report(s) on Form 10-Q. We undertake no obligation to publicly update any forward-looking statement, whether written or oral, that may be made from time to time, whether as a result of new information, future developments or otherwise.